When it comes to the weather, this has been an up and down kind of month. January started out with below zero temperatures, mellowed into nice winter weather, and has now spiked above 40°F. Rain is in the forecast for today, and there’s a foggy mist over snow that has become hard and dirty. Readers, it looks like March out there, and the horror of this is almost too much to bear. As if this weren’t enough, tomorrow the temperature is supposed to take another nose dive, with freezing rain, severe cold, and slippery roads. Even by Maine standards, this is extreme weather. 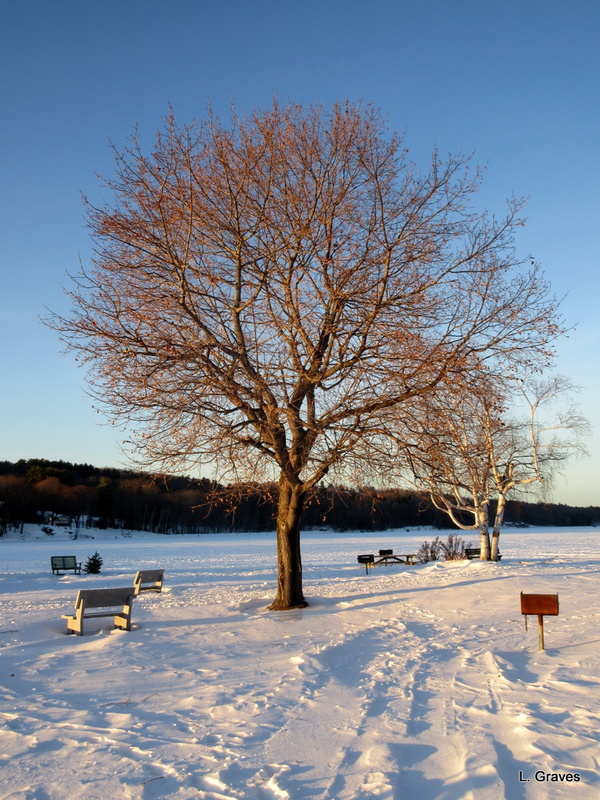 However, on Wednesday, it was a fine winter’s day, and at dusk, at the golden hour, we went to Norcross Point, a little park in town by Maranacook Lake. In spring, summer, and fall, we park the car there and use the park as a starting point for our bike rides. We always see people launching boats as well as using the many benches and tables to relax and have picnics. Not this time of year. 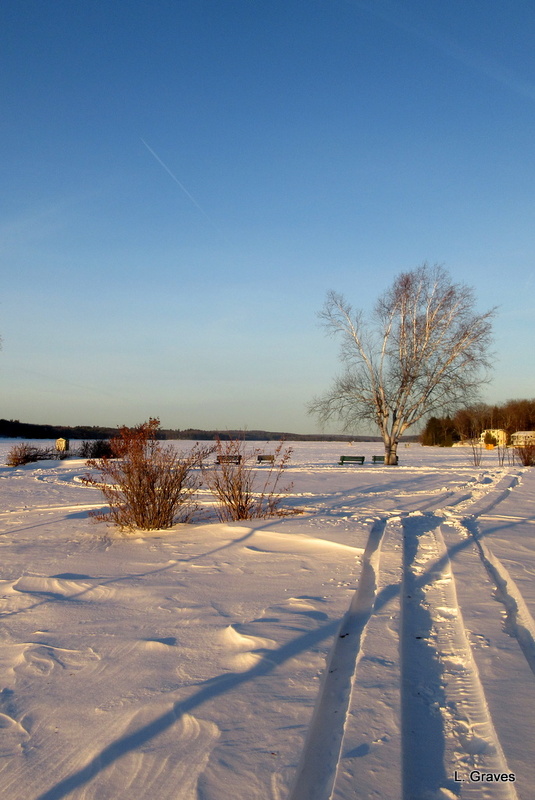 But with a glowing cerulean sky and an expanse of snow, the park and lake are beautiful and welcoming to snowmobilers and those who like ice fishing. This picture shows the expanse of snow and sky, and the lake is so covered with snow that you can’t tell where the land ends and the water begins. 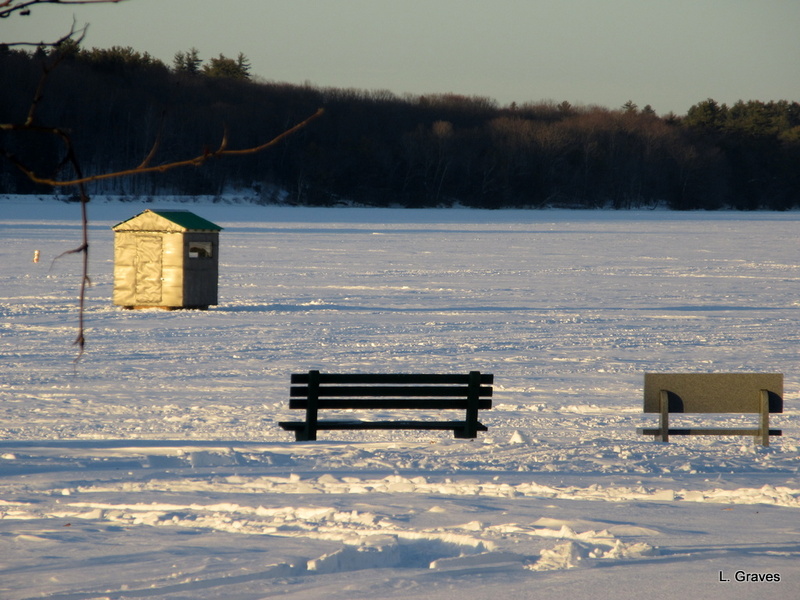 Empty benches overlook an ice-fishing shack. 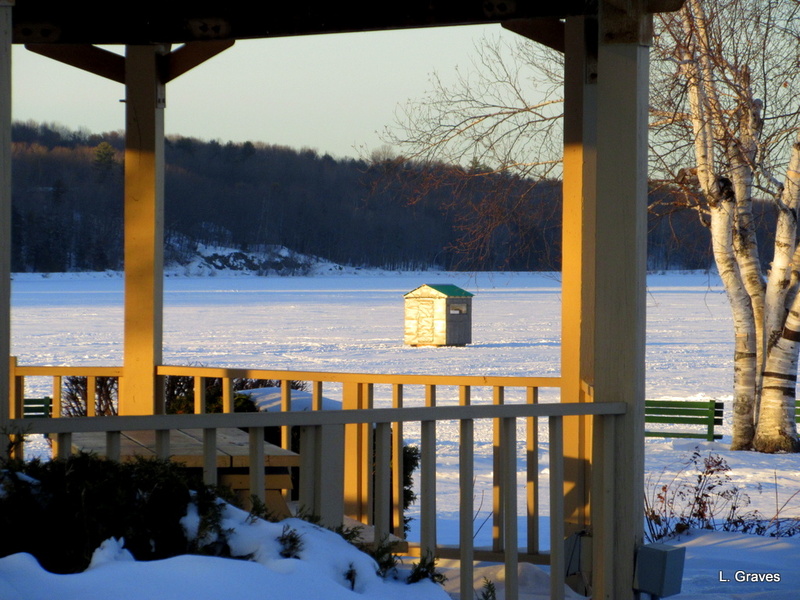 A view of that same shack through the gazebo. Nobody grilling on a snowy day. A bare tree against a deep blue sky. One of my favorite subjects. Here’s hoping that there will be more snow, no more freezing rain, and no more March weather until March. Alas, when I look out my office window, I saw gray, rain, and dripping trees. Hope we get more snow soon. Loved your snowy pictures in the sunshine, keep them coming. Will do! Hope to get some good river pictures next week. Yup, it’s a cold winter alright. I’m with you about no more freezing rain. I’ll take the snow over the ice and freezing any day. Freezing rain is the worst! Love the sparkle of the white snow in the sunshine…beautiful! Thanks, Sheryl! Freezing rain is the pits. Loved seeing your snowy, wintery world. We have to make the most of this yo-yo weather! Yup, a good time for books and movies. Beautiful photos looks a little too cold for me. Have a nice weekend, keeping warm. Beautiful photos of the snow… It is almost blinding with brightness … Hope your March weather stays away! Alas, the March weather is still here. Fingers crossed that we’ll get snow soon to cover the ugliness of it all. I hope that you get proper weather. It is raining right now. Argh! I’m hoping it will snow again soon. Glad you had a chance to catch those moments of beauty. Thanks, Beth. Hope to get some Kennebec River pictures next week. Beautiful photos! I hope the ice stays away and you get March weather in March and not before! No more snow and freezing rain? That’s wishful thinking, Laurie–it’s only January! We had the same warm weather yesterday and now it’s snowing like crazy . . .
Actually, I wrote that I hope there will be more snow and no more freezing rain. 😉 But I can see how it was easy to misread the sentence. Snow in winter is good. Freezing rain, not so much. Even plain old rain is miserable, but at least we don’t have to deal with mudslides. Oops. Need to slow down my reading, I guess! Don’t feel bad. I saw it that way too when I initially reread what I wrote. 😉 Easy to make a typo, and that’s what I thought I had done. Even though I’m a dedicated northerner, I do understand. I also must admit I’m just a teensy, weensy bit envious of those walks on the beach. Beautiful sky. It’s been pretty frigid around here since Christmas. We had one day where it suddenly warmed up, but the temperature plunged again soon after. Thanks, Jason. I love the look of winter in January and February. Those months are never long for me, even when it is very cold. Love the winter scenes, beautiful blue skies and photos this week! We survived our transition from rain and freezing rain to snow and have returned to winter. I can deal with snowy roads, but the icy roads this week were awful. I agree with you, I don’t want to see March weather until March. Crazy weather! And, yes, March is bad enough in March. We don’t need it in January, too. I’m just happy that I’m retired and can stay home when the going gets rough. Crazy fluctuations, but at least it’s not boring. Yes on both counts. Makes a difference when you don’t have to be anywhere and the weather certainly has not been boring. What a winter. Tomorrow, Clif and I will be out and about doing errands. 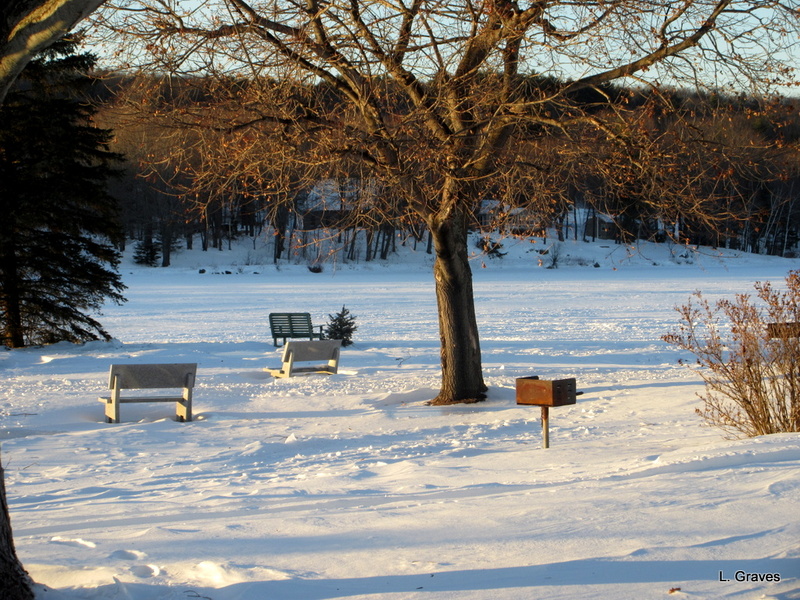 Hope to get some icy flood pictures of the Kennebec while we are at it. Goodness, that is cold in your neck of the woods. Yes, a good time to do inside activities.